From documenting verbal agreements to renegotiating contract terms, here are your most common grain contract questions answered. 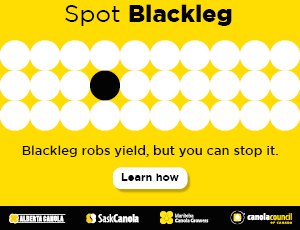 Forward contracts are now commonplace for farmers wanting to market their canola. While grain contracts have similar core attributes, the specific clauses and terms can differ significantly from one grain buyer to another. Here we share the 10 most common questions farmers have about grain contracts. 1. Contracts seem to be written to protect the buyer. What can farmers do to achieve balance? Reading and understanding your grain contract is critical. Always obtain a complete copy of the contract’s terms and conditions prior to agreeing to the sale and make sure to read and understand the conditions before signing. Compare different terms. Some comprehensive contracts on the market contain protections for both the buyer and seller. 2. What happens if I deliver less than the contracted amount? Do tolerances exist (i.e. 5 per cent over and under)? There isn’t a magic number. If you think you will be short on your contract, talk to your grain elevator or processor. Buyers will consider several factors such as stocks position, the likelihood of sourcing the grain elsewhere and the size of your contract. Your grain buyer may be in the position to discuss alternate solutions, and the sooner you speak to them the better your options may be. 3. What recourses do farmers have if their grain is not accepted in the contracted delivery period? All contracts allow for extended delivery periods. As written, you are obligated to deliver in both the initial and extended delivery period. If you are unable to deliver in the extended period, talk to your elevator or processor about making changes, look for contracts with shorter extensions or arrange for alternate delivery terms. Ask what storage fees are available. As of August 1, 2014, all grain marketing contracts must contain provisions to compensate farmers for grain not accepted within the stipulated delivery terms. The application and available compensation varies between companies (some more favourable than others), and by signing the contract you agree to the terms. 4. Does a verbal agreement form part of the contract? Verbal agreements are legally enforceable if they contain the specific elements that constitute a deal, but they can be difficult to prove when the two parties disagree on what was said. Furthermore, make sure to add any verbally agreed upon terms to the Remarks or Special Terms section of your contract or amend them to the contract. 5. Have farmers been successful at negotiating changes to a contract? Some farmers have successfully renegotiated terms within a contract, especially around price and delivery terms. Remember the more farmers that request changes, the greater the chance grain companies will consider it. 6. Is there a process for arbitrating contract disputes? There is no one system for recourse. The best defense is to establish a positive business relationship with your grain buyer and to fully understand the buyer and seller obligations to avoid any dispute. Some contracts reference the arbitration rules established under the National Grain and Feed Association. If there is a dispute over the delivery penalty, farmers can raise the issue directly with the Canadian Grain Commission who may appoint an arbitrator. Legal recourse through a contract lawyer is also an option. 7. Has the Canadian Canola Growers Association considered pushing for a standardized contract? CCGA is not currently advocating for a standardized grain contract. While we recognize that common language would streamline the process, it would also eliminate an element of competition in the market. Companies currently compete for grain based on their contract provisions, and farmers have the choice of selecting contract terms that work best for their farm and its marketing plans. 8. How are liquidated damages calculated? difference between the contract prices and the replacement cost, plus any additional losses the company will incur. If your contract doesn’t stipulate the process for collecting damages, ask your elevator or processor in advance how damage is assessed and consider including this in the notes to the contract. 9. Do contracts contain Acts of God clauses? Act of God or Force Majeure provisions are rare in grain marketing contracts. A handful of companies do provide them, but they are generally offered at a premium or available on specialty or production contracts. 10. Can I get out of my contract? Once signed, the terms and conditions are binding, and most often the contract can’t be broken without buying it out or paying the liquidated damages. Grain contracts can differ significantly from one grain buyer to another so always remember to read and fully understand your grain contract before signing it. If you are unsure of anything in your contract, talk to your grain elevator or processor to ensure a common understanding of the obligations. Good communication is key to ensuring you maintain a good business relationship throughout the entirety of the contract. Want to learn more about grain contracts? 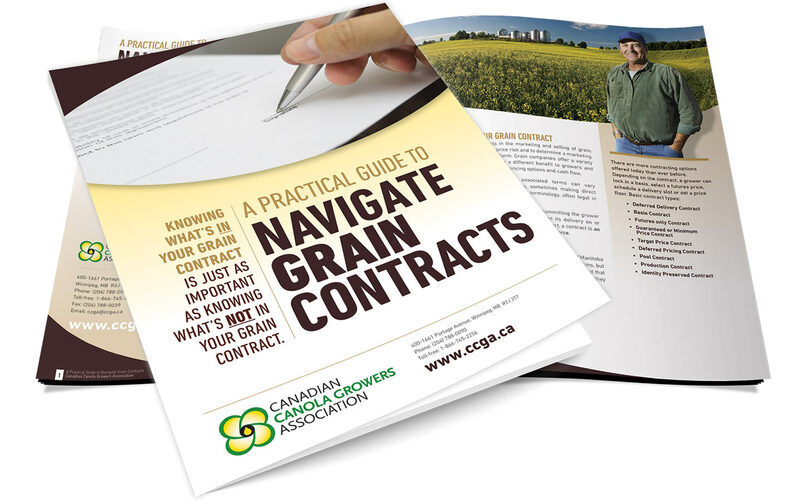 CCGA’s “A Practical Guide to Navigate Grain Contracts” is available for download at ccga.ca/marketing. You can also call 1-866-745-2256 to request a free copy be mailed to you. Janelle Whitley is a policy development manager with the Canadian Canola Growers Association (CCGA) in Winnipeg.